Apple Crumb Cake is an easy apple cake with fresh apples, warm winter spices, topped with cinnamon streusel. The best and simple apple crisp cake that you can make and relish this season!!! 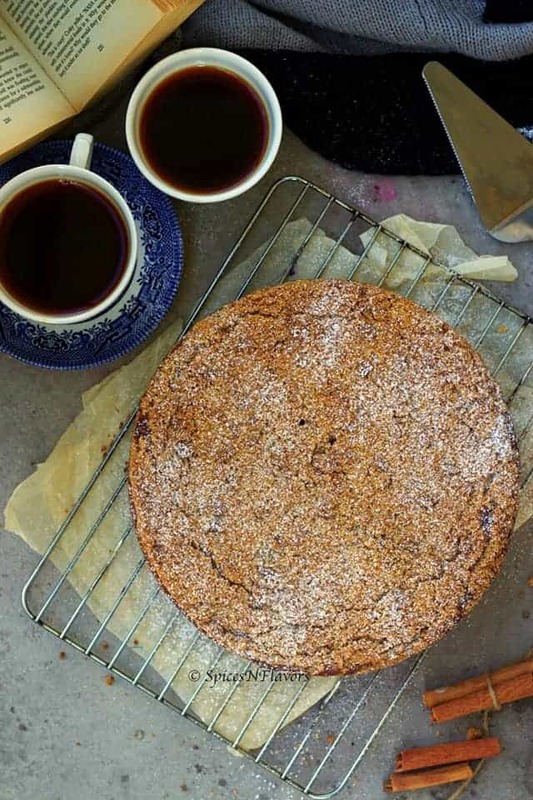 Apple Crumb Cake – Imagine a warm, soft, juicy and moist apple cake with crunchy crumbly topping and black coffee with your favourite book in hands and the cosy corner of your house cuddled up in a warm blanket. Oh my gosh, that’s my kind of perfect winter afternoon. Come winters and warm desserts with seasonal fruits is always a hit. Be it some pumpkin spice desserts like this Pumpkin Custard or a warm apple spice cake or a classic Indian Payasam it is kind of a ritual in every household is what I believe. 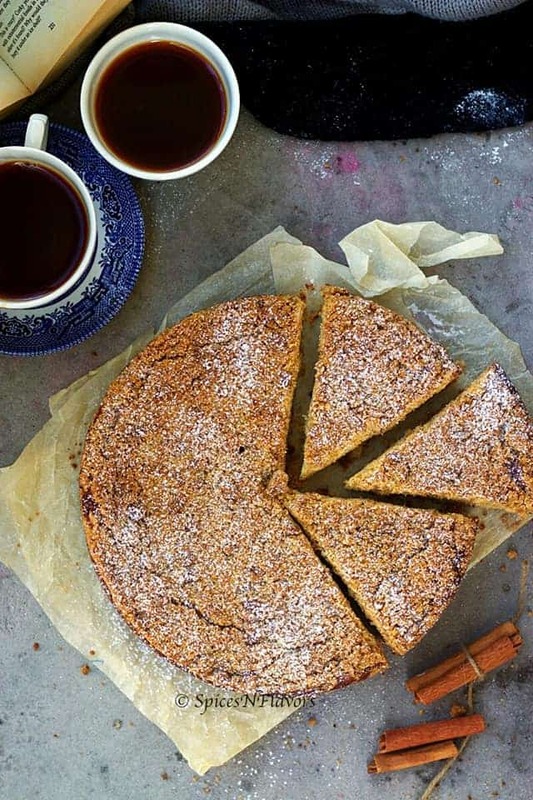 This moist spiced apple cake is one of the traditional Dutch cakes. I have learned this from the bakery course that I took up last year and hence can without doubt claim that it is a tried and tested Dutch Apple crumble cake that is also available locally in all the bakeries across New Zealand. Apples and Cinnamon are a match made in heaven. This cinnamon Apple Crumb Cake is a classic combination of the two in terms of flavour and texture. But How do you make Apple Crumb Cake? It is a pretty usual cake batter which involves the creaming together of butter and sugar, followed by eggs and dry ingredients. What makes it stand out is the addition of fresh grated apples and yoghurt. Yes, that is the secret behind this moist fresh apple streusel cake. There is one more secret actually it is the creaming process which makes this cake super soft. If you are interested in learning the science behind this then definitely check out my chocolate chip cookies post where you will learn the importance of why to cream the butter and sugar until light and fluffy stage. You might be thinking so what this is just a basic Dutch Apple Cake. What is the fuss all about. What makes this cake different. It is that amazing crumb cake topping that makes it stand out. How do you make a crumb topping? 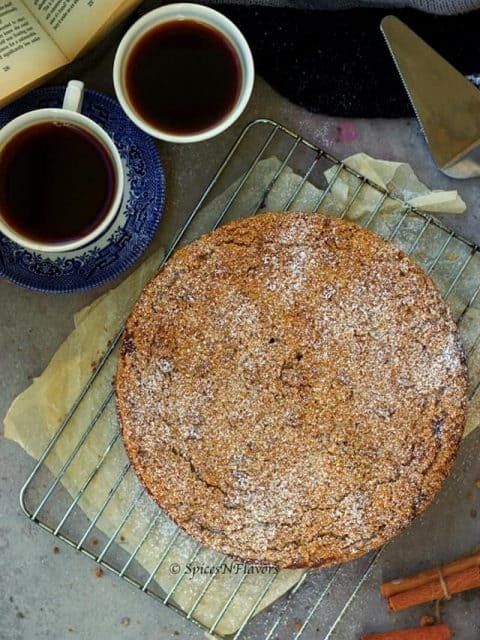 How to make crumb cake? The basic ingredients for a crumb topping are simple – butter, flour and sugar. When you rub the butter into flour you get this amazing sand like texture which when baked turns crispy and crunchy. And this, when topped on a cake, becomes your crumb topping. 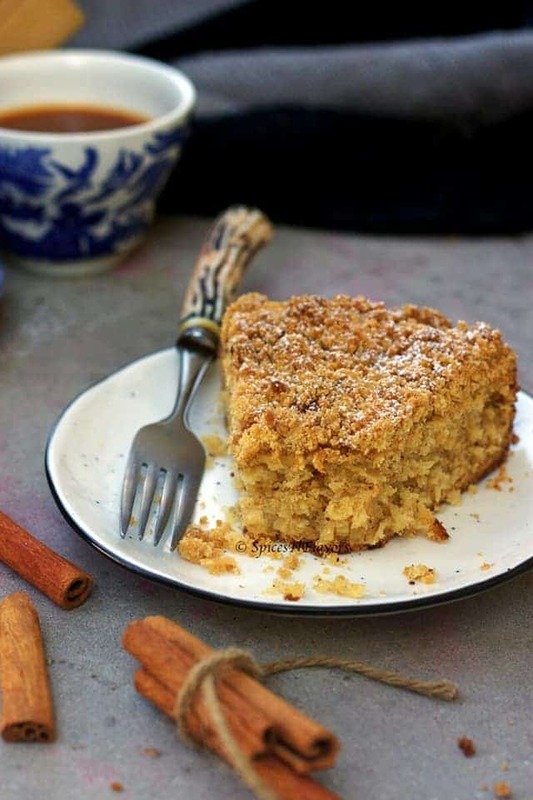 This basic crumb can be taken up a notch by adding some flavourings to it like cinnamon to make an apple cinnamon crumb cake or cardamom to make a cardamom crumble. I used the cardamom crumble while plating up this elegant Master Chef style dessert – Malai sandwich and kesar mousse. The combination of the cinnamon crumble with grated apple cake makes the best cinnamon apple crumble recipe. Can you make apple crumble with eating apples? I would not recommend. As while making the apple crumble you need that tanginess from apples to balance out the butter. However, if you do not find the cooking apples like Granny Smith variety then use the regular apples but you would have to balance it out with some lemon juice. Definitely, these Apple Crumb Cake are on the denser side because of the grated apples. But it is a really soft cake, all thanks to our creaming method. Also a super moist cake due to the addition of yoghurt. Top the cake with some caramel sauce to make your own dutch apple cake with caramel sauce or you can also call it a dutch apple cake with caramel glaze. No mood for caramel sauce then you can also top it with some vanilla syrup which you can make by combining powdered sugar, milk and vanilla. 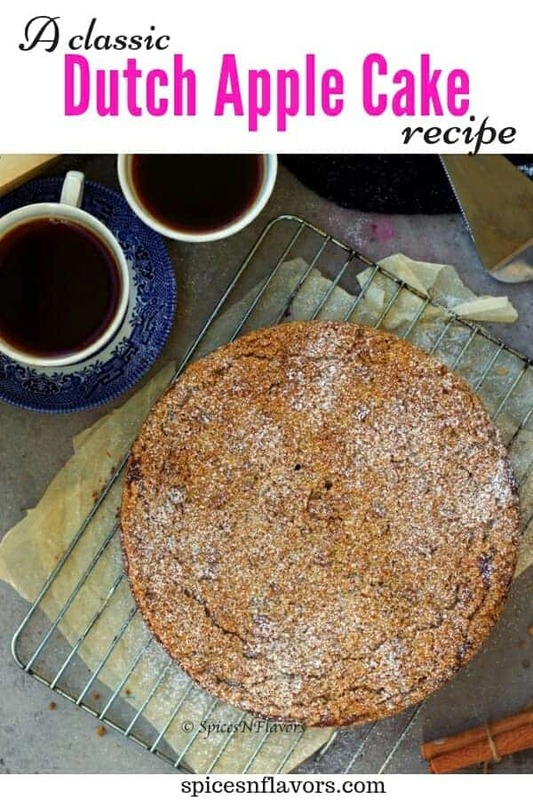 If you would like to try some variation on this simple apple crumble cake then add some coffee extract to the batter to make an apple cinnamon coffee cake or add both caramel and coffee to make caramel apple coffee cake. Add some pecans to make an apple pecan cake that would give some nutty flavour to the cake. Keep it simple or jazz it up with flavours, either way, you would be satisfied having the best apple crumb cake. Cream the butter, caster sugar, brown sugar and vanilla together until light and soft almost white in colour (around 15 mins) using the paddle attachment. Do scrape the bowl every now and then for even creaming. Add eggs one at a time scraping between each addition until combined. Fold in half the sieved flour, ground almond, baking powder, baking soda and cinnamon. Fold in the grated apple into the butter mixture. Fold in the remaining half of the flour mixture and deposit in the prepared cake tin - 9 inches. Forget making Apple Crumb Cake with cake mix because making it from scratch is so easy. 2. Yoghurt adds a nice moisture to the cake. 3. While adding your second egg also add a tbsp of sieved dry flour along with it this would make sure that the batter does not curdle. 4. Another tip if you are starting with cold butter or if your mixture takes long enough to cream the using a blowtorch every now and then you can speed up the creaming process. Just don’t light it long enough at one single point instead move around the exterior of mixing bowl to soften the butter within. Instagram me. Would love to follow you and your posts.